More magical mounds of dairified deliciousness! 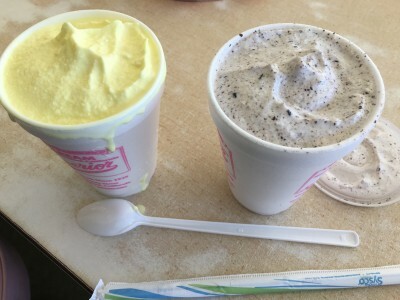 Superior Dairy Product Company, 325 N Douty St, Hanford—Superior Dairy has been around for almost ninety years, and the ice cream parlor was named one of the nation’s top eight shops by Yahoo! Travel in 2013. It’s usually crowded, and for good reason, but the lines move faster than you would expect. The ice cream is delicious, and the servings are mammoth. Even the takeout shakes are luxurious. We had a Lemon and a Chocolate Chip, and we received lessons from a regular sitting next to us. He said first-timers are scared by the crowds and settle for takeout, when they could sit down and get the whole Superior treatment. 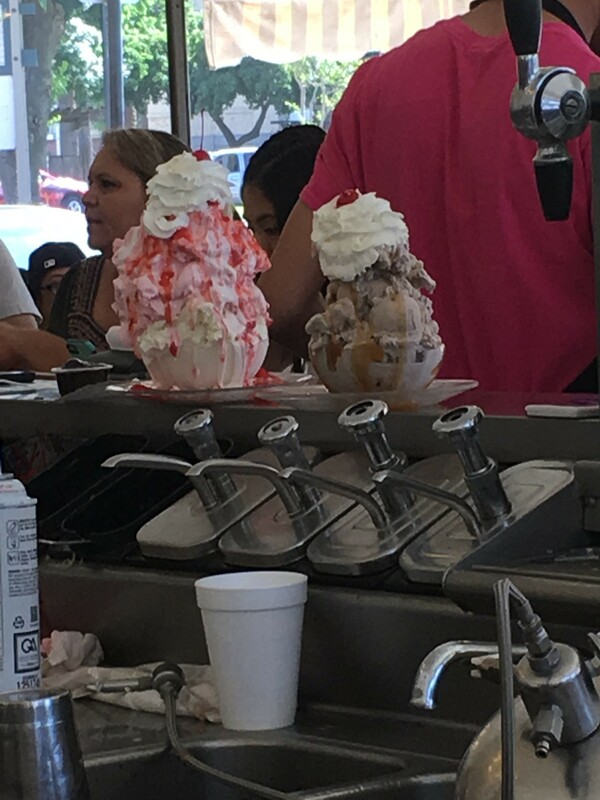 One large shake can give you two containers of leftovers to take home and freeze. How does it taste? OH, YEAH! Rich, creamy, and flavorful. The Amtrak station is two blocks away, and the annual Renaissance Faire is just across the street. Go and enjoy! Lemon and Chocolate take-out shakes from Superior Dairy. The Habit Burger Grill, 1195 Herndon Ave., Clovis—I’ve heard people praise this chain for ages, but I’d never tried it. The burgers are terriff, but I was there for the milk shakes. Mocha is the only option beyond the typical CSV flavors; I went with chocolate. 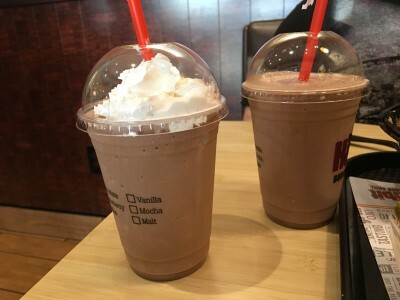 It was topped with a healthy squirt of whipped cream, and it came with a straw of enormous size (which could be used for plumbing repairs in a pinch). The straw cane in handy, because this was one thick shake! A pleasant experience, indeed. By the way, the sweet potato fries were pretty good, and I am now officially addicted to the Tempura Green Beans! Chocolate shakes from the Habit, with and without whipped cream. Baskin-Robbins, 5150 E Kings Canyon Rd. (at Peach), Fresno—The world’s largest chain of ice cream specialty shops, Baskin-Robbins is Americana. Look at that list of 31 flavors (plus CSV) and your head starts to spin. I chose Strawberry Cheesecake, and it made for a fine shake. Good flavor, good texture, and good service. Rally’s, where the whipped cream stands tall. Rally’s, 4818 E Kings Canyon Rd., Fresno—No-frills drive-through. Itty-bitty building with drive-up windows on both sides. If you want to sit and eat, take a bench outside. Now, as to the shakes—Whip It! Whip It Good! You know how some places put a see-through dome over their milk shakes to protect the delicate swirls of whipped cream on top? This dome was to protect the world from The Blob filling every cubic centimeter inside that plastic barrier. Chocolatey and luscious, the shake blended with the topping into a happy time for taste buds and tummies. 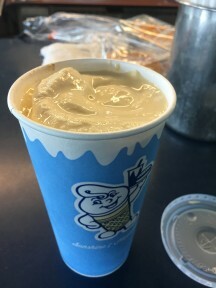 Butterscotch shake from Fosters Freeze in Reedley. 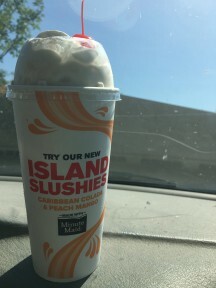 Fosters Freeze, 1460 11th St., Reedley—If Butterscotch is on the flavor list, who am I to resist? Great drive-up fare, but this franchise doesn’t have an outside walk-up window. A friendly shake, a throwback to the basics. Feed the kids for a sugar rush. What we didn’t get at Superior Dairy in Hanford. Could there be any doubt who would win Round 2? It’s…..Superior Dairy, of course! Any trip to Hanford is an excuse to go Superior. Incidentally, one block north, behind the library, is the Children’s Storybook Garden & Museum, a treat for families that blends literacy and agriculture. It’s in its first year of operation, but it’s already something to see. Can I stomach another round of milkshake adventuring? I don’t know, but there are still shakes out there calling my name, from Bakersfield to Hume Lake. 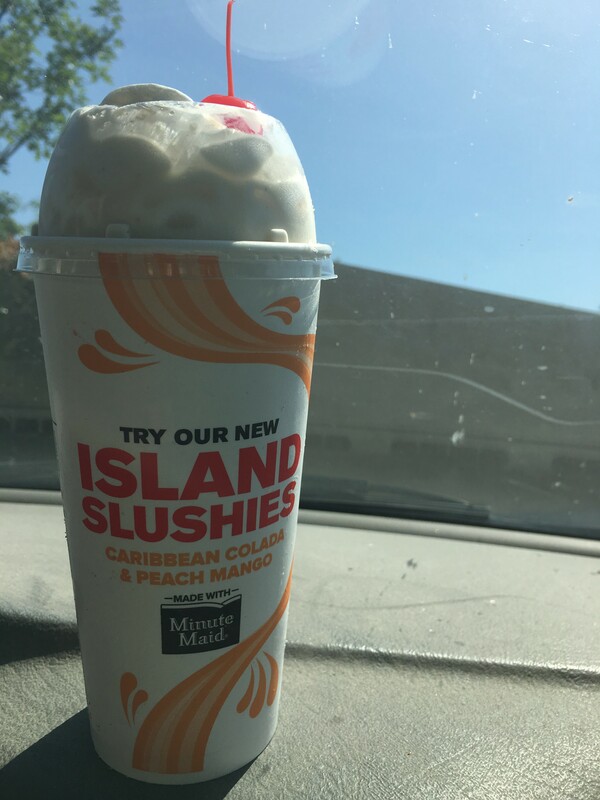 I may take a breather from posting milkshakes, but there is a good chance that there will be a third Great Food Search pursuit of the wild Milkshake. Keep eating! Terrance V. Mc Arthur is a Librarian with the Fresno County Public Library and has published several short stories.